I believe too many Christians take the above scripture and re-translate it like this: “I must be conformed to the world so that I can save the world.” Too many worldly Christians on this planet. The Lord has called us to be a holy people–separate from the world system. The Holy Ghost Fire really separates the wheat from the chaff. 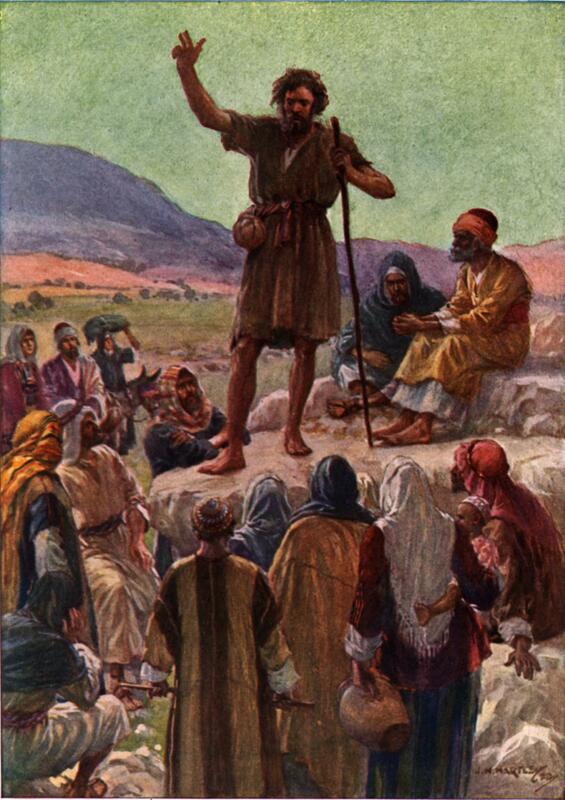 Why did John the Baptist camp out on the other side of the Jordan River? John the Baptist lived a very short life; very little is written about him in the New Testament. Jesus called John the Baptist the greatest man ever born of woman. Maybe we could say that John the Baptist was a greater prophet than Samuel, Isaiah, Jeremiah, Elijah and all the rest of the Old Testament prophets. The Book of Isaiah has 66 chapters; the Book of Jeremiah has 52 chapters; much more is written about Samuel and Elijah than John the Baptist. 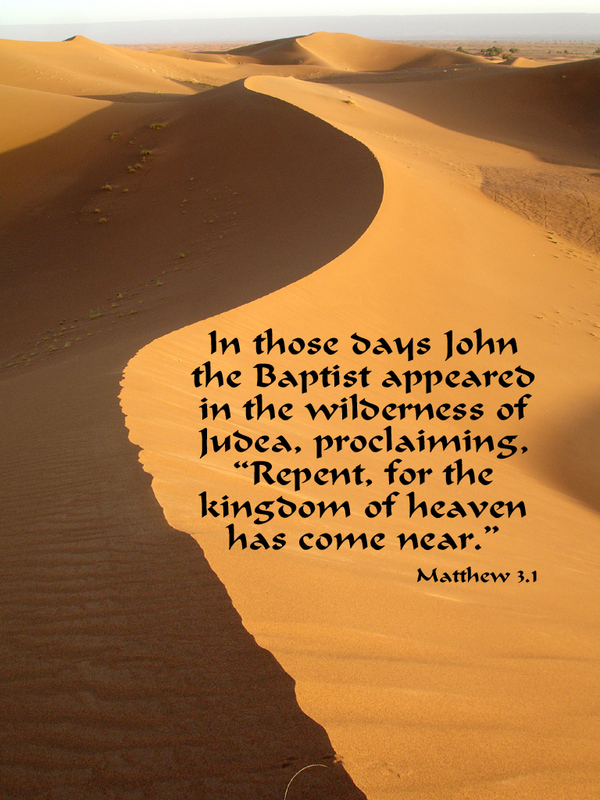 Why is the life of John the Baptist still a powerful witness unto this day? Probably because the crucified life has more power than the words that come out of our mouth. “Tell me what time you spend alone with God . . .
Matth. 11. 7, 8, 9. But what went ye out for to see ? A man clothed in soft raiment? behold, they that wear soft clothing, are in Kings houses. But what went ye out for to see ? A Prophet ? yea, I say unto you, and more then a Prophet. Although his name implies that he baptized people (which he did), John’s life on earth was more than just baptizing. John’s adult life was characterized by blind devotion and utter surrender to Jesus Christ and His kingdom. John’s voice was a “lone voice in the wilderness” (John 1:23) as he proclaimed the coming of the Messiah to a people who desperately needed a Savior. He was the precursor for the modern day evangelist as he unashamedly shared the good news of Jesus Christ. He was a man filled with faith and a role model to those of us who wish to share our faith with others. Most everyone, believer and non-believer alike, has heard of John the Baptist. He is arguably one of the most significant and well-known figures in the Bible. While John was known as “the Baptist,” he was in fact the first prophet called by God since Malachi some 400 years before his own birth. John’s own coming was foretold over 700 years previously by another prophet. In Isaiah 40:3-5 it states: “A voice of one calling: ‘In the desert prepare the way for the LORD; make straight in the wilderness a highway for our God. Every valley shall be raised up, every mountain and hill made low; the rough ground shall become level, the rugged places a plain. And the glory of the LORD will be revealed, and all mankind together will see it. For the mouth of the LORD has spoken.’” This passage illustrates God’s master plan in action as God selected John to be His special ambassador to proclaim His own coming. Little is actually known of John, although we do know that John was a Levite, one of the special tribe set aside by God to take care of all of the work associated with the temple (Numbers 1:50-53). John was the son of Zechariah, a temple priest of the lineage of Abijah, while John’s mother Elizabeth was from the lineage of Aaron (Luke 1:5). John was also related to Jesus as their mothers were cousins (Luke 1:36). 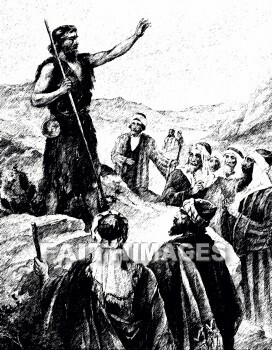 John lived a rugged life in the mountainous area of Judea, between the city of Jerusalem and the Dead Sea. It is written that he wore clothes made out of camel’s hair with a leather belt around his waist. His diet was a simple one—locusts and wild honey (Matthew 3:4). John lived a simple life as he focused on the kingdom work set before him. John’s ministry grew in popularity, as recounted in Matthew 3:5-6: “People went out to him from Jerusalem and all Judea and the whole region of the Jordan. Confessing their sins, they were baptized by him in the Jordan River.” We also see that he spoke very boldly to the religious leaders of the day, the Pharisees and the Sadducees, calling them a “brood of vipers” and warning them not to rely on their Jewish lineage for salvation, but to repent and “bear fruit in keeping with repentance” (Matthew 3:7-10). People of that day simply did not address leaders, religious or otherwise, in this manner for fear of punishment. But John’s faith made him fearless in the face of opposition. While his ministry was gaining strength, John’s message was gaining popularity. In fact, it became so popular that many people may have thought that he was the Messiah. This assuredly was not his intent as he had a clear vision for what he was called to do. John 3:28 tells us, “You yourselves can testify that I said, ‘I am not the Christ but am sent ahead of him.’” This verse speaks of John cautioning his disciples that what they had seen and heard from him is just the beginning of the miracle that was to come in the form of Jesus Christ. John was merely a messenger sent by God to proclaim the truth. His message was simple and direct: “Repent, for the kingdom of heaven is near” (Matthew 3:2). He knew that once Jesus appeared on the scene, John’s work would be all but finished. He willingly gave up the spotlight to Jesus saying, “He must become greater; I must become less (John 3:30). Perhaps there is no greater example of humility than the one demonstrated by both Jesus and John in Matthew 3:13-15. Jesus came from Galilee to be baptized by John in the river Jordan. John rightly recognized that the sinless Son of God needed no baptism of repentance and that he was certainly not worthy to baptize his own Savior. But Jesus answered his concern by requesting baptism “to fulfill all righteousness” meaning that He was identifying Himself with sinners for whom He would ultimately sacrifice Himself, thereby securing all righteousness for them (2 Corinthians 5:21). In humility, John obeyed and consented to baptize Jesus. John’s ministry, as well as his life, came to an abrupt end at the hand of King Herod. In an act of unspeakable and violent vengeance, Herodias, Herod’s wife and the former wife of Herod’s brother Philip, plotted with her daughter to have John killed. So incensed was Herodias at John for claiming her marriage to Herod to be unlawful that she prompted her daughter to ask for the head of John on a platter as a reward for her pleasing Herod with her dancing. 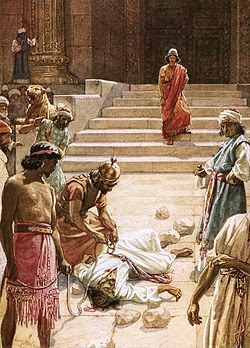 John had previously been arrested by Herod in attempt to silence him, and it was a simple thing to send the executioner to the prison and behead John, which is exactly what happened (Mark 6:17-28). This was a sad and ignoble end to the life of the man about whom Jesus said: “I tell you, among those born of women there is no one greater than John” (Luke 7:28). There are several lessons we can learn from the life of John the Baptist. First, whole-heartedly believing in Jesus Christ is possible. John the Baptist could have believed in and worshipped any number of gods available to him before Jesus arrived on the scene. But at some point in his life John knew that the Messiah was coming. He believed this with his whole heart and spent his days “preparing the way” for the Lord’s coming (Matthew 11:10). But the road was not an easy one to prepare. Daily he faced doubters of various influence and popularity who did not share his enthusiasm for the coming Messiah. Under hard questioning from the Pharisees, John shared his belief: “‘I baptize with water,’ John replied, ‘but among you stands one you do not know. He is the one who comes after me, the thongs of whose sandals I am not worthy to untie’” (John 1:26-27). John believed in the Christ and his great faith prepared him for hardships, but it kept him steadfast on his course until the time when he could say as he saw Jesus approach, “Look, the Lamb of God, who takes away the sin of the world!” (John 1:29). As believers, we can all have this steadfast faith. Second, anyone can be a strong and serious witness for Jesus Christ. John’s life is an example to us of the seriousness with which we are to approach the Christian life and our call to ministry, whatever that may be. We pattern our lives after John’s by first examining ourselves to be sure we are truly in the faith (2 Corinthians 13:5). Second, like John, we are to know and believe that “to live is Christ and to die is gain” (Philippians 1:21), so we can be fearless in the face of persecution and death. 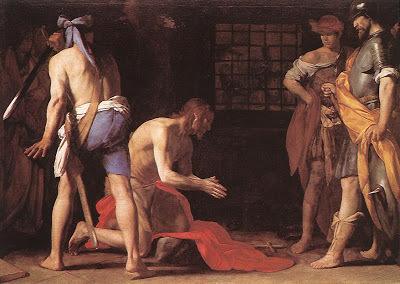 John lived his life to introduce others to Jesus Christ, and knew the importance of repenting of one’s sins in order to live a holy and righteous life. And as a follower of Jesus Christ, he also was unafraid of calling out people such as Herod and the Pharisees for their sinful behavior. Third, John shows us how to stand firm in our faith no matter what the circumstances. Paul reminded Timothy that “everyone who wants to live a godly life in Christ Jesus will be persecuted” (2 Timothy 3:12). But for many of us who live in freedom, persecution takes on a very mild form. As he lived in an occupied country, John had to be aware that anything contrary to utter devotion to the king or emperor was asking for trouble. Yet his message was unchanging, bold and strong. It was John’s belief, his message, and his continual rebuke of King Herod that landed him in prison. While it is hard to know for sure what John was feeling as he sat in prison, we can be sure that he might have had some doubts about the Lord who tested his faith. In fact, John gets a message out to Jesus asking, “Are you the one who was to come, or should we expect someone else?” (Matthew 11:3). As Christians we all will have our faith put to the test, and we will either falter in our faith or, like John, cling to Christ and stand firm in our faith to the end. Pages 5-7: “Strangely enough, though, some who come to Jesus Christ seem to immediately and fully embrace this barbarian way. They live their lives with every step moving forward and with every fiber of their being fighting for the heart of their King. Jesus Christ has become the all-consuming passion of their lives. They are not about religion or position. They have little patience for institutions or bureaucracies. Their lack of respect for tradition or ritual makes them seem uncivilized to those who love religion. When asked if they are Christians, their answer might surprisingly be no, they are passionate followers of Jesus Christ. They see Christianity as a world religion, in many ways no different from any other religious system. Whether Buddhism, Hinduism, Islam, or Christianity, they’re not about religion; they’re about advancing the revolution Jesus started two thousand years ago. “This is the simplicity of the barbarian way. If you are a follower of Christ, then you are called to fight for the heart of your King. It is a life fueled by passion–a passion for God and a passion for people. The psalmist tells us to delight ourselves in the Lord, and He will give us the desires of our hearts (Psalm 37: 4). When Christianity becomes just another religion, it focuses on what God requires. Just to keep people in line, we build our own Christian civilization and then demand that everyone who believes in Jesus become a good citizen. 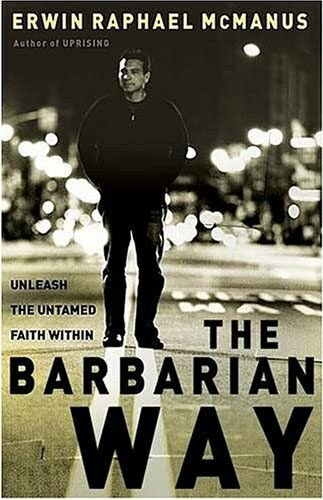 Page 13: “The barbarian way is about love, intimacy, passion, and sacrifice. Barbarians love to live and live to love. For them God is life, and their mission is to reconnect humanity to Him. Their passion is that each of us might live in intimate communion with Him who died for us. The barbarian way is a path of both spirit and truth. The soul of the barbarian is made alive by the presence of Jesus. Pages 21-22: “Several things about John [the Baptist] stand out right away. He was an unusual dresser with strange eating habits. Just in case you’re uncertain, wearing clothes made of camel’s hair was not the height of fashion, even during the time of Jesus. We are told he ate locusts and wild honey. I suppose the wild honey was to help get the locusts down. “He was clearly not a fan of the established religious leaders. His nickname for the Pharisees and Sadducees, who were the pinnacle of the religious elite, was ‘brood of vipers.’ Nope, that was not a term of endearment. And I think it’s important to note that his fire-and-brimstone message was entirely directed toward the religious, not the irreligious. He was a barbarian in the midst of civilization. And frankly the civilization made him sick. He had no patience for domesticated religionists who were drowning in their own self-righteousness. Pages 32-33: “So what is this good news? The refined and civilized version goes something like this: Jesus died and rose from the dead so that you can live a life of endless comfort, security, and indulgence. But really this is a bit too developed. Usually it’s more like this: if you’ll simply confess that you’re a sinner and believe in Jesus, you’ll be saved from the torment of eternal hellfire, then go to heaven when you die. Either case results in our domestication. One holds out for life to begin in eternity, and the other makes a mockery out of life. Page 58: “Although John was confused about Jesus, Jesus was not confused about John. Jesus knew that everyone else was confused about John. John lacked religious pedigree, yet he clearly spoke with spiritual power. At the same time he didn’t look anything like a priest or a teacher of the law. To put it bluntly, John was just plain weird. Not what you would expect when you were looking for a spiritual leader. John’s faith was raw and untamed. There was nothing civilized about him. Pages 60-61: “Jesus was making clear that being a disciple was never intended to be the equivalent of being molded into a stereotype. Jesus and John were considered barbarians, even though they expressed themselves in different ways. But at the core they were the same. They lived and moved in the mystical. That is, they had a unique and transcendent connection to the Creator of the universe. Guided by the voice of God, they cared little how others perceived that. What was invisible to others was clear to them. Their lives could not be explained apart from God. Page 82: “If you are a follower of Christ and you have allowed yourself to be domesticated, you have lost the power of who you are and who God intends for you to be. You were not created to be normal. God’s desire for you is not compliance and conformity. You have been baptized by Spirit and fire. Asleep within you is a barbarian, a savage to all who love the prim and proper. You must go to the primal place and enter the presence of the Most High God, for there you will be changed by His presence. Let Him unleash the untamed faith within you. Pages 108-109: “There is a barbarian revolt taking place, and its command center is the kingdom of God. Everywhere the kingdom of God advances, there is a violent engagement against a dark kingdom. To be born of God is to be made a citizen in the kingdom of God, and the kingdom of God is at war. Do not confuse this kingdom with Paradise. Salvation is not reentry into a Paradise Lost; it is enlistment in the mission of God. 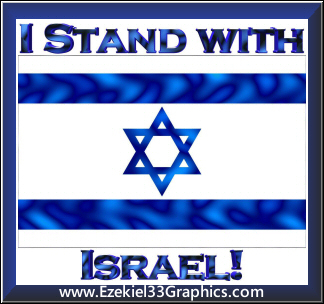 “Jesus is telling us in no uncertain terms that there is a battle raging. This is perhaps the most important reason why we must choose the barbarian way and resist any temptation to become civilized. Domesticated Christians are far too willing to abdicate for the soul of the world. Civility focuses our energy on all the wrong places. We spend our lives emphasizing our personal development and spiritual well-being. We build churches that become nothing more than hiding places for the faithful while pretending that our actions are for the good of the world. Or we choose political and secular vehicles to try to advance our cultural values, strangely attempting to make unbelieving people act like civilized believers. Page 121-122: “Just yesterday a husband and wife told me that they raised their first son to be a gentleman, and now as a man he does not walk with Christ. They went on to say, ‘We have a second son, and we’re going to raise him as a barbarian.’ They understood firsthand the painful difference between a civilized Christian and the barbarian way of Jesus. Pages 126-127: “When we are born again, we are dropped not into a maternity ward, but into a war zone. Our birthplace is less mother’s womb and more battlefield earth. Maybe the first word we hear should not be ‘welcome,’ but ‘jump.’ There is no trial run, no practice life. Page 128: “It is true that the enemy will essentially leave you alone if you are domesticated. He will not waste his energy destroying a civilized religion. If anything, he uses his energy to promote such activity. Religion can be one of the surest places to keep us from God. When our faith becomes refined, it is no longer dangerous to the dark kingdom. Pages 140-141: “Jesus leads us into the heart of the dark kingdom, into the soul of what is most evil. He takes us where mankind has chosen to live. He calls us to where the darkness has made those who wander there desperate for light. He leads us as warriors of light to risk our lives for the deliverance of others. Again, our own weapons are love, hope, and faith, and they are our only defense. Yet we above all know that they and only they liberate us and fulfill the deepest longings of our souls. Last night I had a disturbing dream. I was wearing a rough garment—it was brown; it looked like it was a robe made out of burlap. I wore a belt around my waist. I looked like John the Baptist or else I felt like John the Baptist. Everywhere I went people became very angry at me. I would say something and then people would violently reject me. Sometimes I would walk to where people were gathering and I wouldn’t say anything—just my walking into their air space angered them. Then there was this one guy: he was short and mean-looking. He had a whip. The whip had a wooden handle and several strips of cord attached to the top of it; on the end of each strip of cord was a nail: it looked like the cat-of-nine-tails. This guy hated my guts. Two or three times during the dream he would come after me and whip me. The dream was long; most of the details are gone from me now. The odd thing about this dream was that when it was over, it was played over again—like a movie reel. The exact same dream was repeated twice. This reminds me of that Scripture: “In the mouth of two or three witnesses let every word be established.” So whatever this dream means, it is established. Or maybe it means that it will happen soon. In my life, because of my Christian faith, I have been rejected by family, friends and church people, so this dream makes sense. 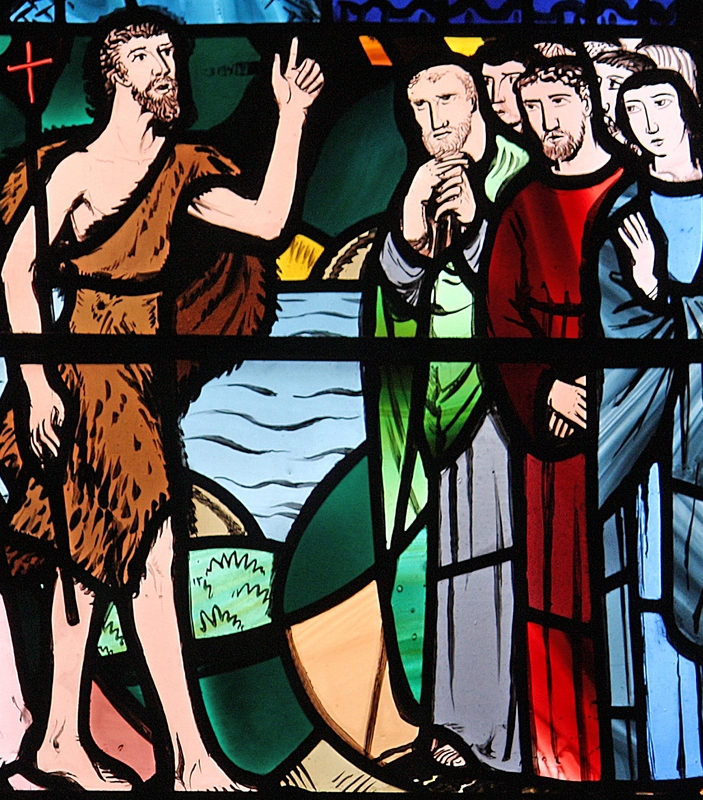 What should we learn from the life of John the Baptist?